Folic acid is a synthetic form of folate, a naturally occurring B vitamin that is naturally present in a variety of foods and which plays crucial role in the human body. It is a water-soluble vitamin which means that the body cannot store it hence should be continuously supplied in the body through diet or supplementation. It is naturally found in some foods such as green leafy vegetables (e.g. broccoli, lettuce, and spinach), fruits (e.g. bananas, lemons, and melons), beans, asparagus, okra, yeast, mushrooms, meat (e.g. beef kidney and liver), tomato juice, and orange juice. Since 1998, staple foods such as breads, bakery items, cookies, cold cereals, crackers, and pasta have been fortified with this vitamin making these fortified foods the major sources of folate in the American diet. Though fortified food sources can provide extra folic acid, the body absorbs this vitamin best in the products where it naturally occurs. For people with folic acid deficiency, supplements are readily available and inexpensive. These are non-prescription food supplements which are considered safe for use. Folic acid is available in different trade names, with Folvite as one of the more popularly known, although it is also available in generic form. It is available in tablet form that contains 1 mg of folic acid. Several pharmaceutical companies manufacture this vitamin supplement. Supplements are available in many different doses. The typical multivitamin will contain 400 mcg of folic acid. This is an adequate daily dose for most adults. However, pregnant women are advised to consume 600 mcg a day and breastfeeding women should get 500 mcg of folic acid daily. Folic acid supplements are primarily used for the treatment of folic acid deficiency and conditions associated with it including alcoholism, kidney dialysis, liver disease, and ulcerative colitis. For the pregnant women, it is prescribed to prevent miscarriage and birth defects, particularly neural tube defects. They are usually given to pregnant women as soon as conception. It is well recognized in the prevention of neural tube defects in newborns (birth defects characterized by malformations of the brain and spine). Aside from this, folic acid also has other important health benefits such as prevention of certain types of anemia; reducing the risk of heart disease and stroke; and prevention and management of certain types of cancer. Folic acid plays crucial role in the human body. It is needed in the formation of healthy cells, especially red blood cells. In fact, people with low folate levels can suffer from certain types of anemia and inability of the gastrointestinal system to absorb certain nutrients. Folic acid deficiency may be caused by some medical conditions such as certain gastrointestinal problems, pregnancy, malnutrition, alcoholism, liver disease and kidney dialysis. Some individuals are at a particularly high risk of folic acid deficiency. Patients on kidney dialysis and those with liver disease or ulcerative colitis are more likely to be deficient in this vitamin. High alcohol intake and certain medications can lead to folic acid deficiency as well. Folic acid may also be used to prevent heart disease, stroke, cervical and colon cancer. Natural age-related diseases that may be prevented or treated with folic acid supplements include age-related macular degeneration (AMD), osteoporosis, hearing loss, memory loss, restless leg syndrome, pain, Alzheimer’s disease and Fragile-X syndrome. 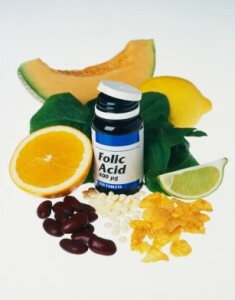 Folic acid supplement may also be taken for the prevention of cervical cancer and colon cancer. It may also help reduce the risk of cardiovascular disease and stroke because of its ability to reduce homocysteine – a chemical that is associated with heart diseases. Supplements may also help prevent memory loss, age-related hearing loss, Alzheimer’s disease, macular degeneration, signs of aging, uncontrolled leg twitch (restless leg syndrome), fragile bone (osteoporosis), sleep problems, skin disease called vitiligo, nerve and muscle pain, depression, AIDS, and a genetic disorder called Fragile-X syndrome. It is also used in the treatment of certain drug overdose lometrexol and methrotrexate. Some people use this supplement to treat gum infections by applying it directly into the gums. Folic acid tablets are taken orally with or without food, usually once a day. If you are taking this vitamin over-the-counter, be sure to read and follow all instructions on the product information label. If you are taking this vitamin under prescription of your healthcare provider, be sure to read and follow the prescription label. Consult your healthcare provider or pharmacist for questions or if you do not understand the prescription. For maximum benefit, this drug should be taken regularly. Avoid missing doses. Never adjust or increase your dose unless specifically instructed by your healthcare provider. Inform your healthcare provider if you have known allergies to folic acid or its contents; or if you have other allergies. Discuss with your healthcare provider your medical history, especially if you have pernicious anemia (vitamin B12 deficiency). Pregnant women can safely take folic acid when used as directed. It is usually included in prenatal health supplements. Although folic acid passes into breast milk, it is not likely to cause harm on the breastfed child. If you are pregnant or are breastfeeding, consult your healthcare provider before taking this supplement. Spironolactone is a generic medication used to remove the build-up of excess fluids from the body caused by certain medical conditions. The brand name of the generic drug infliximab, Remicade is an artificial monoclonal antibody that reduces inflammation caused by certain autoimmune disorders. Prednisone belongs to a class of drugs known as corticosteroids; these medications reduce inflammation throughout the body.